His music is heard on television shows such as "Star Trek," "Wings" and "The Simpsons." Through the first week of February, Cathedral City Elementary School second-graders will hear cellist Ray Kelley's music live - as a part of his Palm Springs Unified School District cello tour. At Sunny Sands Elementary School on Jan. 23, students watched Kelley as he performed several songs on stage with his 1694 Giovanni Grancino cello. Besides playing music, Kelley talked about different types of cellos and where they are made - mentioning that he believes the best cellos are made in Italy. David Mendoza, 8, was impressed by the instrument. "I might get a cello one day," David said after the event. Kelley's career spans decades. He actually started playing the piano at age 7. He changed instruments at 13, when he began taking cello lessons, starting in Beginning String Class at his junior high school. Then, he saw others play the cello. Kelley's father, Richard Kelley Sr., was the principal string bass for the Los Angeles Philharmonic until he died. 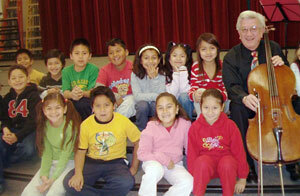 His brother, Richard Kelley Jr., plays the bass for the L.A. Philharmonic and has been playing for 52 years. Ray Kelley, 69, said he still enjoys his work - a job in which he says he "plays" all the time. He's recorded music with famous performers such as Paul McCartney, Neil Diamond and Gloria Gaynor, he said. He now wants to instill his passion for the cello in children. "I feel it's so important that youngsters be exposed to classical music and all forms of music," Kelley said about why he accepted the district's offer to talk to students. After his stint in Cathedral City, Kelley will go on to visit students in Palm Springs and Desert Hot Springs.